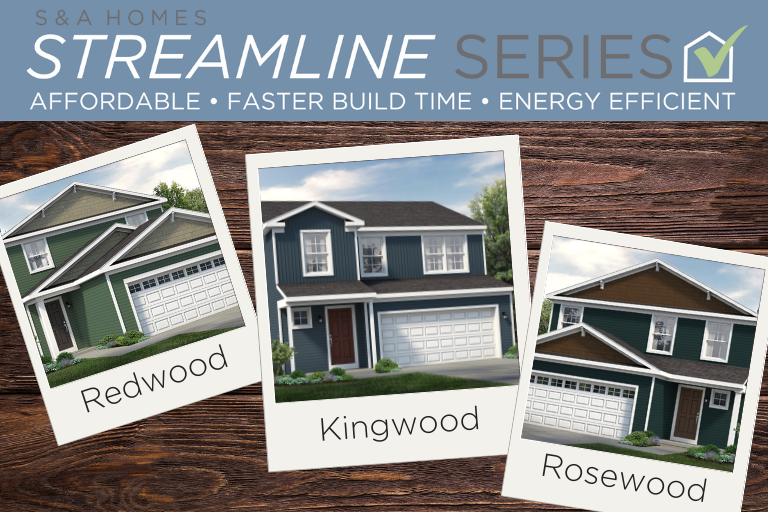 Local home builder S&A Homes is excited to announce that three quick delivery homes, each part of the energy-efficient Streamline Series, will be available soon at Steeplechase, a collection of new Pleasant Gap homes. With one home nearly complete, one under construction and the third breaking ground soon, these opportunities will not be available long at this destination community. Steeplechase, set in a prime Pleasant Gap, PA location with stunning mountain views, features thoughtfully designed single-family homes from the $249,900s. Homebuyers have five home designs to choose from, all of which are a part of the Streamline Series, featuring three bedrooms, two-and-a-half baths, two car garage, and up to 1,932 square feet of impressive living space. The Kingwood on Homesite 52, affordably priced at $259,900, is projected for a late January move-in. This spacious three-bedroom home features a bright and airy two-story entrance foyer and an expansive great room completely open to the kitchen and extending the full width of the home. Upstairs is a sizable laundry room, two large bedrooms located toward the front of the home and a spacious owner’s suite with private bath located toward the rear of the home. A hall closet in the entry, a second-floor linen closet, large bedroom closets and substantial space in the owner’s bath provide plenty of storage throughout. This home is located at 126 Shady Hollow Drive in Pleasant Gap. Currently under construction on Homesite 53, the Redwood home design features three bedrooms, two-and-a-half baths and 1,689 square feet of open-concept living space. The spacious great room, featuring a gas fireplace, extends to the open kitchen with island, granite countertops and stainless steel appliances. The adjoining dining room features sliding glass doors leading to the outdoor living space. The dual-purpose laundry room/mudroom off the two-car garage completes the main level of this home. Two generous secondary bedrooms with full bath join the impressive owner’s suite on the upper level. Serving as the perfect retreat, the owner’s suite boasts an ample walk-in closet and oversized, private bath. This home, located at 124 Shady Hollow Drive in Pleasant Gap, is priced at $269,900 and projected for a spring move-in. Construction will start soon on the Rosewood, located on Homesite 54. The largest of the Streamline Series collection, the Rosewood boasts 1,932 square feet of impressive living space with three bedrooms and two-and-a-half baths. The perfect layout for entertaining, the expansive family room area includes a cozy gas fireplace and opens to the kitchen, which features granite countertops, upgraded cabinetry and stainless steel appliances including a gas range, microwave and dishwasher. An oversized, 48-inch kitchen island with overhang and walk-in pantry with plenty of storage space complete the main level. The upper level features a spacious loft area, convenient laundry room and two generous secondary bedrooms toward the rear of the home, complete with a shared Jack-and-Jill bathroom and double bowl sinks. The impressive owner’s suite features a walk-in closet and luxury owner’s bath. This home, priced at $304,900, is located at 122 Shady Hollow Drive. The builder’s exclusive Streamline Series of homes puts homeownership within reach with affordable pricing, a simplified buying process and faster build time – all without sacrificing the quality construction and energy efficiency S&A Homes is known for! To learn more about the new Pleasant Gap homes coming soon to Steeplechase, call 1-855-SAHOME1 or click here.